Belmont University hosted Tech Inclusion Nashville Forum, an event created to provide an opportunity for community members in the technology fields to discuss solutions to diversity and inclusion, on Tuesday, August 29 in the Janet Ayers Academic Center. Co-organized by Co-Founders of Black in Tech Nashville Dr. Fallon Wilson, Jurnell Cockhren and Jarrett Strickland and Change Catalyst and sponsored by Google Fiber, the Forum addressed jobs and education, access and opportunity, empathy and allyship, inclusion and accessible design and creating inclusive policy, among other topics. Speakers included representatives from community organizations focused on inclusion within technology including Veterans Who Code, Nashville Girl Geek Dinner, Women in Technology in Tennessee, Nashville LGBT+ in Tech and many more. Panel discussions featured conversations surrounding building inclusive cultures, creating an inclusive tech ecosystem, making venture capital inclusive and creating an includes tech pipeline. Wilson said Black in Tech Nashville, a relatively new organization to the city, was interested in hosting this event to ensure Nashville continues to grow in a way that represents the leadership, innovation and voices of the diversity that forms the community. “We wanted to bring together amazing thought leaders from tech companies, education institutions, community-based organizations and government to collectively learn, discuss and plan for a more representative workforce in our tech and knowledge economy,” she said. Looking back on the event, Wilson said she can point to sheer attendance as a successful metric — but her views of why the event exceeded expectations go behind the numbers. “The many meaningful conversations had on panels and at lunch let’s me know that we as a city will move in the right direction of developing processes to ensure access to the new world of tech for all people,” she said. 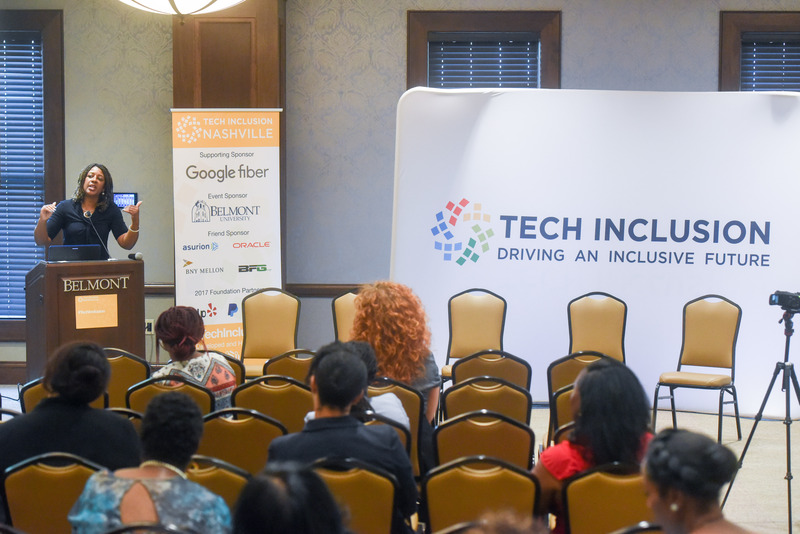 The forum was held as part of Tech Inclusion, a series of events that drive solutions to diversity and inclusion in technology. To learn more about Black Tech in Nashville, click here.